Food blogs can attract a lot of website visitors, because everybody eats, but your interests and the way you develop your blog website determines the type of followers you will have. If you love to cook, and share your cooking with others, you may create a site like Henriettibles, with scrumptious recipes written with easy to follow directions and a taste of humor. Having fun and cooking good food; a combination that is hard to beat. New cooking tips and food related information keeps Henriettibles Facebook page followers coming back and visiting the website. Although Miz Jackie’s Catering and Promotions doesn’t have a website yet, owner and chef Jacqueline A B Davis keeps followers informed about local events she is catering and shares positive thoughts via posts on her Facebook profile and her Facebook business page. 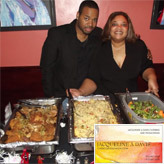 So many people enjoy her catering because Miz Jackie loves cooking quality, good, fresh, and healthy foods with no salt, sugar, or grease, and enjoys making a memorable presentation of her food. Each of these sites has (or will have) a food blog, but each site is focusing on interests of different website visitors. What is the focus of your website? What people do you want to see what you share on your website? Are they young adults, or seniors? Are they mostly women, or mostly men? Do you want young, stay at home Moms to read the content of your website, or are you more interested in communicating with young professionals? The people you want most to see your website are your “target audience”. Your website will get more visitors and more returning visitors if your website is focused on your target audience. Jax SEO Works can help you figure out who is the target audience for your website. Contact Jax SEO Works to get started improving your website.